Just a few weeks before the start of another school year, 22 teachers across San Mateo County gathered at Marine Science Institute, located in Redwood City. This group of Pre-K to 3rd grade teachers registered for KQED Science Lab and were excited to plunge into four days of professional development. The teachers came dressed in layers for unexpected Bay Area weather and sat outdoors overlooking the San Francisco Bay Estuary. The weather couldn’t have been more perfect. The warmth of the sun, clear blue skies and the occasional sighting of brown pelicans gliding above the shores, set the stage for a jam-packed day of learning about marine science. Sharing the space with the teachers that morning were 50 young children participating in the Shoreside program. Both teachers and children were on a mission to learn from the bay, find cool critters and have fun. But before observing invertebrates from a mud grab, or pulling up marine life using a beach seine, the teachers first had an assignment. Each one was given a hand-held, pocket-sized video camcorder—a Flip Ultra HD—and asked to record a child engaging with marine life at one of the designated stations. The purpose was to explore how video could serve as a viable tool for formative assessment—a way to evaluate the quality of learning to support teaching and learning. Recording the child’s observations, questions and thinking at various stages of the inquiry process, provides an opportunity for teachers to use video as a way to document and assess student learning. It’s also a great way to get to know a child. To learn more about using video as a documentation and assessment tool, use these six guidelines and explore using digital media in everyday practice. Science Lab teachers – Let’s hear from you! Add your comments on your experience. Thank you Marine Science Institute and STEM Center of San Mateo County Office of Education. You ROCK! Science Lab teachers – Please complete this survey. Best wishes for a fun-filled year of making videos and integrating STEM! This was a wonderful opportunity to get together with educators from around the Bay Area. The ability to share with other educators from different age levels was amazing. This has helped me with to understand how I can introduce science to my students in a way that will hopefully align to the K-12 common core standards. Thank you for all of the great information and resources! What a wonderful experience to learn more about integrating math, science, and technology in the beautiful location of the Marine Science Institute in Redwood City! I truly enjoyed learning and working with my fellow educators as we are on the journey to find interesting ways to engage and educated our students. I am excited about implementing these practices this coming school year. Thank you KQED, San Mateo County Office of Education and the Marine Science Institute. This has been one of the best PDs I’ve taken. The Flip camera will be a very valuable tool inside my classroom for observations and to improve student learning. I really enjoyed making the videos and observing all the Marine life. I also know if I have any questions about Marine animals, I’ll email Hayley! I look forward to continuing the relationship with STEM, KQED and MSI. This class has changed my view of what the new science standards can be. It is so much more than being able to “find the right box” on the paper test! 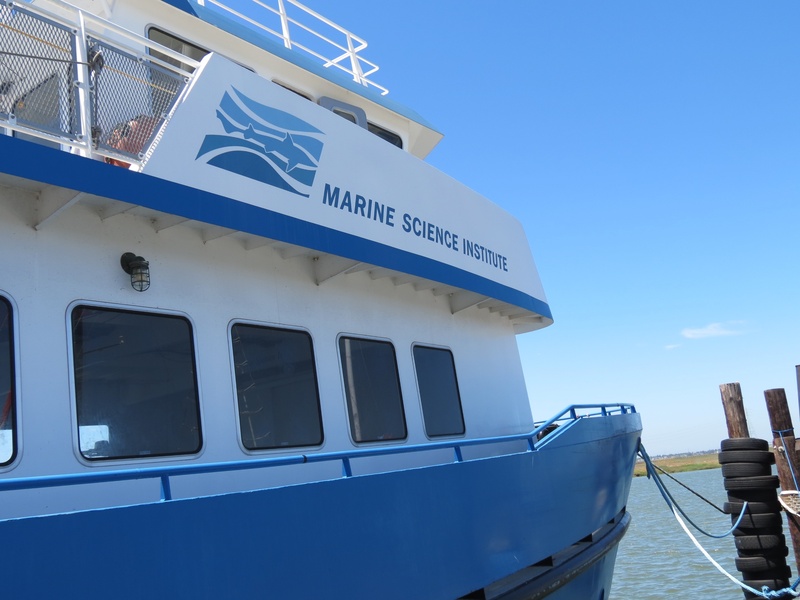 The Marine Science Institute is an amazing experience for students and teachers. Thank you to our teaching team for your hard work and to KQED for hosting this class. Through the KQED Science Lab, I learned beneficial and exciting ways to use the Flip in my classroom. I will not only try it out during science lessons, but also during reading groups, math games and as an assessment tool. I am looking forward to trying it out in my class! what a wonderful professional development opportunity. the time i spent with KQED and MSI was well worth it and i can see many benefits for my students including, but not limited to, a deeper understanding of science and math and how they are related to engineering. Thank you KQED so very much for four fabulous days of professional development! I loved learning about technology and am so excited to implement my new flip in my classroom. It was also amazing to be at the MSI and STEM and not only be a learner but to also observe students learning. Loved Science Lab! Can’t wait to introduce the kids to marine life! Thank you Marine Science Institute, STEM, SMOE, and KQED for giving teachers an opportunity to experience science, technology, engineering and math through the lens of a FLIP video camera! This experience offered a unique perspective when considering assessing and observing children that will enhance the way I teach and document development moving forward. I look forward to applying this knowledge and sharing it with my colleagues. I am grateful for the professional development! Thank you! Thank you KQED, MSI (Marine Science Institute) and SMCOE (San Mateo County Office of Education) for a great week! When teachers get together to talk about best practices and to learn and implement new technologies – there’s nothing better. It elevates thinking, motivates and breathes new life into teaching, and reminds us that as teachers in order to teach well, we must ourselves be learners. We must constantly ask ourselves what we are doing, how we are doing it, why we are doing it and how, if possible, can we make it better. Being able the talk about the Next Generation Science Standards in conjunction with using video technology and being able to use it immediately, was fantastic! I am excited to use video in the classroom not only as a form of assessment but as a tool for teaching across all curricular areas. This has been a very informative class! Learning to use technology in the classroom has inspired me to do some new things in the classroom. It is so important to see through the eyes of a child! I am excited for school to start so I can apply these new strategies that I have learned! Thank you so much for this inspiring class! I am so excited to utilize all of the new technology and media tools that I learned about in the KQED Science Lab. I can’t wait to use the flip cam to assess students and record important moments that I want students to learn from. The flip cam also teaches me more about how my students learn which is incredible. I now have access to websites with cool ideas for hands-on science experiments. Thanks again and I am looking forward to the next class! This was a wonderful 4 day workshop. Not only did we have the opportunity to film activity at the Marine Science Institute, we spent time at the SMCOE Stem Center learning how to edit on the flip camera and turning our footage into a movie. I am so excited to take this tool back to the classroom. I see it having a multitude of uses from student observation, evaluation, documentation, and as a general “memory” of special activities. I also feel this flip camera will be a useful tool for me to do self reflection and evaluation of my own teaching practice. I also want to acknowledge The Marine Science Institute, it was my first time going there and I loved it. I’m excited to introduce my students to what they have to offer! KQED, thanks for providing this opportunity to us. It was so great to meet all of you! Good luck with your flip cams this year. I hope to see your work during the year and I will incorporate your fabulous ideas into my classroom. Thank you Nancy for a job well done, and of course the other “staff” that made the week so special. The KQED Science Lab was a great experience. I love how science and technology was well integrated in this workshop and I am excited to implement media technology along with The Next Generation Science Standards within my Kindergarten classroom. I greatly appreciated being able to work hands on at MSI with students and the marine life. All the instructors were extremely welcoming and knowledgeable. I came in without any knowledge of how to use a flip camera and now I can’t wait to explore and experiment the many ways I could use it to enhance my teaching skills and student learning. I feel much more comfortable and excited to use the new technology we will have in our classroom. Thanks! This workshop was absolutely fantastic educational experience for all of the participants.One of the best workshops I’ve attended. Innovative and practical stuff I can apply, using media and technology in the classroom… We learn about using video as a documentation and assessment tool and how to document and assess student learning. part of the teaching practice. The KQED Science Lab was a wonderful experience! The resources available to teachers on the PBS that I never knew existed and I cannot wait to use them in my classroom! The experience really changed the way I feel about teaching science and making the curriculum available to my students. This was the best PD I have ever taken. The Marine Science Institute was wonderful and My Grandchildren will be coming to the day camp. The technology we learned with the cameras and the computer will help me with all my computer work. A big shout out to all three participating groups; KQED, MSI and SMCOE. Thank You!! Prev Music & Dance at the East Bay Center for Performing Arts Next Teachers: Back-to-School Election Event Coming to KQED!! !